ouch. no win situation. don't take the day off to take care of kids for fear of getting written up. take the kids and hide them and get written off. Jungledoc wrote: What is everyone doing this Summer? Keeping up with training? Taking a break? It's Winter here. It was nearly below 10 degrees celsius last week. Unbelievable. Training I expect I'll continue for 10 more weeks with a strength then possibly a power cycle, then as Spring hits it'll be time for a short break. Sorry! I didn't think about our members from the Southern Hemisphere. I also live south of the equator, but in the tropics, so we don't have distinct seasons. I still tend to think about the seasons "back home". I've already started thinking about summer, it was a good reminder for forward planning. I had a dream about deadlifting last night. Should I be conserned? Currently I'm trying a program in which I only deadlift every four weeks, and even then it's quite light. I sure love that lift. Even if this program works, I will stop doing it after the 12-16 weeks or so. Because Deadlifting > everything. 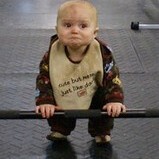 Dub wrote: I had a dream about deadlifting last night. Should I be conserned? I had a dream I was at a theme park with Morgan Freeman. He didn't want to ride the rollercoaster but I persuaded him. Dub wrote: Because Deadlifting > everything. No. Don't be concerned. This is normal. All normal people want to be powerlifers down deep, whether they admit it or not. If you had dreamed of being a bodybuilder, I'd recommend therapy. Well, we've gotten our passports with our shiny, new, multiple-entry visas for PNG. We are now on track to leave early Tuesday, and to arrive back in our beloved Highlands on Friday. Workout schedule will suffer some until we're back there. I learned today that the two new barbells at my gym are 55 lbs, not 45 lbs. Consequently, many of my recent lifts were more than I thought. I benched last night whilst wearing a weight belt. Really liked it!! Going to use it in competition. KPj wrote: I benched last night whilst wearing a weight belt. You'll be wearing it for curls next. And don't try and pretend you don't do curls. I know you do. haha, just seen that. I do train biceps. In the last 10 weeks, i've had one bicep curl variation per week. 3 x 10 of reverse curls (these seem to really help sore elbows, btw - I forgot about them until recently). The 10 weeks before that is was normal EZ bar curls, 3 x 10. I actually have full intention of doing more arm work but it's been difficult to consistently fit more than that in so far. Still, though, it's progress. "Hey, I borrowed your body for about a week. Sorry about the herpes. Also, you're gonna want to stay away from Baltimore. The police are going to be looking for you there. In fact, you better stay out of Maryland entirely. Meanwhile, if a guy named Vinny shows up looking for his money, you need to pay him. He's not the kind of person you play games with. PS) Your wife's sister is WILD! I'm pretty sure your wife heard us though. My bad." I am now the oldest missionary on Kudjip Station, where we live in Papua New Guinea. There may be a few older locals here, but I doubt it, since most retire here at 55. The previously oldest just left to take a new assignment. This is a little bit like being the oldest person in town. Happily it's a very small town. I broke two wrist straps on one set today ... first one, then the other, within a second of each other. Jungledoc wrote: I am now the oldest missionary on Kudjip Station, where we live in Papua New Guinea. There may be a few older locals here, but I doubt it, since most retire here at 55. The previously oldest just left to take a new assignment. This is a little bit like being the oldest person in town. Happily it's a very small town. Soon you'll be holding court and settling local disputes. Get yourself a big hat of some sort.